Ways to jazz up spruce up and clean up your wheels but include your leather and apply a leather conditioner. To the office from Monday to Friday, to the supermarket and the beach on weekends, all over the island in search of good food whenever the mood strikes, and cross the borders for a holiday… your car is such an integral part of your daily life, it’s almost part of the family. Give your car lots of TLC to keep it in tip top condition – that’s your key to happy partnerships! Here’s what you can do. • Wash your car at least once a week to remove surface dirt like dust, mud, grease spots and bird droppings. If the contaminants are not removed quickly, they can stick to the paintwork permanently. Wash and rinse one section at a time, working from top to bottom. • Never substitute car-washing products for dishwashing liquid or household cleaners. The latter are likely to be too harsh and contain harmful detergents, abrasives and additives that can strip off the wax and damage the paintwork. • Wash your car in a shaded area or during the cooler parts of the day like early morning or late afternoon. Washing in the hot sun may cause uneven drying, which can leave residue and streaks on your car. After the final rinse, wipe away excess water with a clean terry cloth to prevent watermarks from forming. • Wax your car at least twice a year to protect it from damage and to maintain color and shine. Waxing helps remove paint oxidation and surface dirt, while adding a protective coating. It can play down or remove minor damage such as surface scratches and light contamination, and provide a high-luster finish. • Keep your tires properly inflated. Under-inflation increases heat built-up in the tires, causing them to wear out more on the outside and shorten their lifespan. Over-inflation causes tires to expand more than needed, and also wear them out in the center. • Each tires wears out a different rate as each supports a different weigh. Tyre rotation should be done every 7,000 to 8,000 km to achieve even tread wear and maximize tread life. Tires should be balanced whenever they are remounted. • Look out for the tread wear indicator which shows the tires begin to wear out. These lines become visible at approximately 1.5mm below the tire surface – a sign that it’s time to change tires. • Maintain car tires at the manufacturer’s recommended pressure. Some marques will even advise a different level for front and back tires, and if the car is carrying a heavy load or doing a long distance journey. The spare tire has a lower recommended pressure than the main tires. • The car battery starts the engine when you turn on the ignition. Once the engine is running, the alternator takes over to supply the car’s electrical needs while restoring the charge to the battery. Prolong the life of your battery by getting into the habit of turning off all the lights. Heated rear window and radio before you switch off the car engine. • To check the condition of your car battery, look for signs of cracks and other physical damage on the battery case and corrosion at the connections of large battery cables. A cracked battery needs to be changed immediately as the electrolyte leaking out is a mixture of sulfuric acid and water. • Top of the battery with distilled water whenever necessary to ensure that the acid level in each cell is above the plates. If you have a maintenance-free battery, you can skip the battery water, but you still have to check that the battery is secured and the terminals are corrosion-free. • Check the reddish oil puddles under the car as they could mean a leak from either the automatic transmission or power steering systems. The automatic fluid level should not drop below the minimum mark. At should also be clear without any metal filings or black flakes and no burning smell. • Auto transmission fluid should be changed on schedule; otherwise you will be lubricating your transmission with contaminants. This will shorten the life of your transmission. Transmission fluid doesn’t burn up, so if you find the level dropping, it is quite certain there is a leak somewhere. • To check the level of engine oil, park your car on level ground and wait for at least five minutes after switching off the car engine. Remove the dipstick, wipe it clean, then replace it and pull it out again. The oil level should be between the maximum mark. If the oil is very black, a complete change may be needed. • Inspect the windscreen blades whenever you clean your windshield. Don’t want until the rubber is worn or brittle to replace them. You need them in good working condition in a heavy downpour. Make sure the windshield washer fluid reservoir is filled. • Give the floor mats a good shake regularly to remove dried mud, leaves or sand hat may be picked up by passengers’ feet. Vacuum frequently to remove dirt from floor carpets and upholstery. • Spills and stains should be cleaned up as soon as possible to prevent stains from setting. Keep a stash of tissue paper and wet wipes handy to clean dirty spots before carrying out serious cleaning later with the right equipment. • For leather seats, use a leather and conditioner regularly to prevent the leather from cracking. For upholstered seats, use an appropriate cleaning foam or shampoo, followed by a protective layer. Always check for colorfastness first by testing a small patch in an inconspicuous area. • Keep loose items in a secure place like the glove compartment, side pockets and other cubby holes. If you have ornaments on the dashboard, make sure they are properly secured. Don’t turn these objects into projective if you brake suddenly. • One way to protect your car interior and upholstery while easing the load on the air-conditioner is to put up heat and UV-resistant window film. • Send your car for a professional grooming package that takes care of the interior as well. It saves you the hassle of getting your hands dirty. 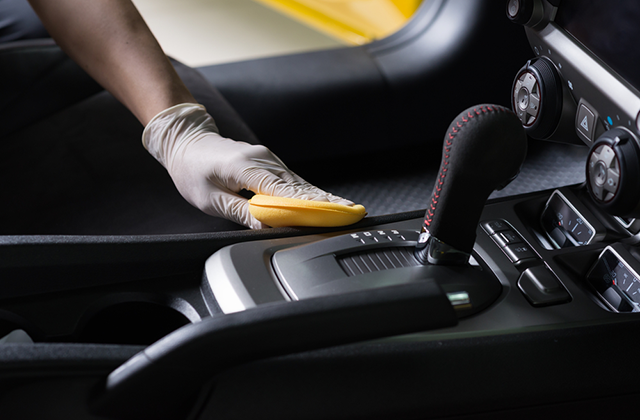 Some vehicle workshops even offer deodorizing and sterilizing treatments that get rid of germs and odors. • If you can feel every bump and hump your car is going over. The shock absorbers might be worn out and need to be replaces. Not only will the ride be more comfortable with new shock absorbers, but the better handling response also means that your car is able to react more quickly in an emergency. Be sure that the installation is done according to the manufacturer’s recommendation. • Car spoilers are aerodynamic additions that are normally mounted on top of a car’s trunk or positioned under the front bumper. Spoilers can make a provides a down force for better stability at higher speeds.